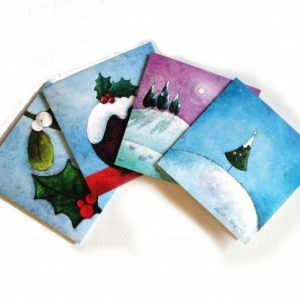 A nice little set of four (4) blank greeting cards, perfect for absolutely any occasion…! All the illustrations are taken from my own colourful and vibrant paintings. This “Landscape Collection” set features great colours and patterns, and would be great for any occasion. You could also decide to give this set away as a little present for a teacher or a work colleague etc. The cards are printed on lovely 300gm card stock and are wrapped individually in a cello bag with their envelope.